Food Sovereignty, what is it? Food sovereignty is a term coined by members of Via Campesina in 1996 to refer to a policy framework advocated by a number of farmers, peasants, pastoralists, fisherfolk, indigenous peoples, women, rural youth and environmental organizations, namely the claimed "right" of peoples to define their own food, agriculture, livestock and fisheries systems, in contrast to having cross-border trade in food. 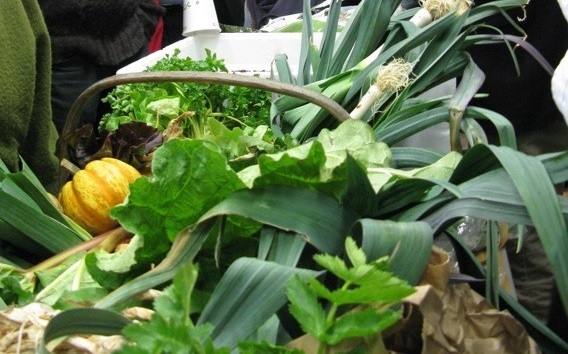 Transforming the food system � how do we build a movement for food sovereignty in the UK? gardeners and allotment holders including people from Garden Organic International Team and The Permaculture Association. The aim of this meeting was to begin to explore how we should develop an active food sovereignty movement in the UK and support individuals and producers to take control of how food reaches our plate in a manner that does not damage the environment and is sustainable. The Food Sovereignty Movement aims to help people to take control of our food system moving away from the control supermarkets and multinational businesses have over this system and give power back to local communities. It wants the European Union and the UK to support local food production and make clear the corporate responsibilities of the multinationals. The two-day event at Hawkwood used the Transition style methods such as open space to develop ideas and to build a cohesive strategy for the UK movement and a hierarchy of practical actions was created. This was facilitated by very skilled group leaders who donated their time, which made the process very productive. Two days of workshops started with a report on practical actions that had already taken place since the European conference. Then participants were asked to explore what they understood by the term food sovereignty as a concept as opposed to food security. Many people find it easy to use these terms as interchangeable but it was pointed out that Aid can offer food security to populations, if only temporarily, but food sovereignty puts the power back into the hands of the farmers, producers and consumers. It localises control and protects common rights to saved seed, making land ownership secure. Food Sovereignty helps to retain local distinctiveness in foods for the people who produce and eat that food, creating food democracy. A research group to map groups, individuals and businesses who might be stakeholders in this movement - to help grow membership of the movement and progress it aims. A second research group to explore how to support small mixed farm, which are more productive than farms specialising in just six crop rotation. They would aim to influence DEFRA so that funding and government policy supported crop research for these mixed growers and demonstrated the value of small farms to society. Another group to organise the next conference in order to take development of the movement further. To set up a media and communications group to educate the government, public and businesses about food sovereignty and break down stereotypes in the media. To develop a more effective website and administration. To use the hub model for communication between groups. To organise a Festival of UK food movement stakeholders. To have a working group on how to increase access to healthy food to the wider population. Help seed saving, Heritage seed groups and anti-GM technology groups working together. Encouraging groups to sign up to the Nyeleni declaration. The agreed priorities for the group has been to focus on the second research group and to develop the website, set up communications group and organise a further conference. Participants at the conference were interested in our food system operating in a different way from the current system where supermarkets have most of the power and control, leading to insecurity and lack of support to farmers and agricultural workers here and in the southern part of the globe. 3. To become a member of the movement email list email info@foodsovereigntynow.org.uk or locally come to a Transition Cambridge food group meeting see bulletin for meeting dates.